Lean Reflections: Is Pinterest of any use to our lean teams? 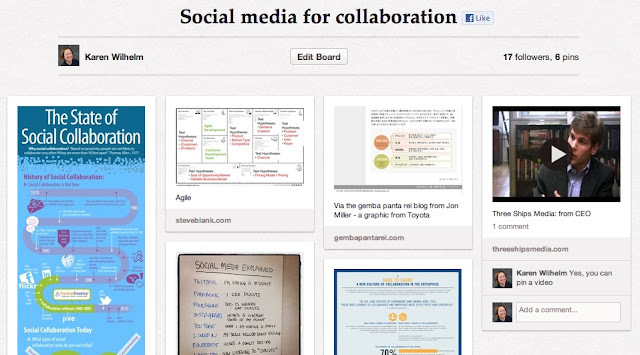 Is Pinterest of any use to our lean teams? Pinterest is growing exponentially and people are finding unexpected uses for it. My daughter-in-law and her girlfriends are on a virtual spring break in Rio right now using Facebook to talk about it and Pinterest to show where they go and what they pack to wear. I can envision uses for our teams. With the visual nature of Pinterest, you could upload your images of a workstation, visual control, or screen capture (that's what the image above is -- I couldn't find a way to embed my actual board here in Blogger). Then by combining images on a team problem or project board, you could use the comment feature and/or a conference call to discuss an issue with your team. How can we use Pinterest to advance our work in lean and continuous improvement? I urge you to experiment. If you need an invite in order to join, contact me. The corporate counterpart, like Yammer is the internal Twitter tool, must be in development somewhere. I think we have a game changer here. Let me know where your imagination takes you.